Elephant Theatre Company Artistic Directors David Fofi and Lindsay Allbaugh have announced that the company will be taking one year off (the 2012 season) from mounting productions, with the intention of using the year to strengthen the company, and restructure the management and membership, as well as the Board of Directors. The Elephant also plans to hire a Managing Director, and to focus on the development of sustainable fundraising initiatives. The Elephant Theatre Company, now entering its 16th season, is a staple of the Los Angeles theatre community. Known for developing and producing new work, the company has been named three years in a row by Back Stage as ‘Favorite Theatre Company to See and Work With,’ as well as receiving multiple Ovation, LADCC, and LA Weekly award nominations and wins. Last season’s west coast premiere of Kate Fodor’s 100 Saints You Should Know is currently nominated for four LA Weekly Awards, and one LADCC Award. The Elephant concluded its very successful 15th season with the world premiere play Love Sick by Kristina Poe, and the rarely produced Baby Doll by Tennessee Williams, both of which had extended, sold out runs. Hollywood’s Elephant Theatre Company will return in early 2013 with an exciting new season of plays. A job description for the position of Managing Director will be posted in March. For more information, visit www.elephanttheatrecompany.com. Visit the Elephant on Facebook, and follow us on twitter @elephanttheatre. The Blank Theatre’s Young Playwrights Festival is seeking submissions nationwide from playwrights 19 years of age and younger. The submission deadline is March 15, 2012. Winning plays will be presented by professional actors and directors from May 31 – June 24, 2012 at the Stella Adler Theatre in Hollywood, CA. Celebrating its 20th anniversary year, The Blank Theatre’s Young Playwrights Festival is a nationwide competition that produces the work of twelve teenaged playwrights each year. Since 1993, the festival has produced 220 plays by playwrights 19 and younger from 27 states. Each winning play will have four performances in a weekend run. The productions are made possible in part by grants from Ralph M. Parsons Foundation, The Plum Foundation, The Rosenthal Family Foundation, Los Angeles County Arts Commission and City of Los Angeles Department of Cultural Affairs. Hollywood’s Blank Theatre has had its work featured on MSNBC, CNN Showbiz Today, Entertainment Tonight, BBC, CBS, ABC, NBC, PBS, NPR, in Entertainment Weekly magazine, and in the Financial Times of London. The rules for the festival competition are as follows: playwrights must be 19 years of age or younger on March 15, 2012; original plays and musicals can be any length, on any subject. 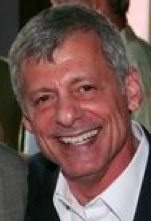 Scripts must be legible; pages must be numbered and unbound; submissions must be postmarked or emailed by March 15, 2012. There is a limit of three (3) plays per playwright. All plays must include a cover sheet with the play’s title, playwright’s name, date of birth, school (if any), mailing address, contact phone number, e-mail address and the play’s production history (if any). Visit www.YoungPlaywrights.com for further information. In past years, some winning plays have gone on to have a life on The Blank’s mainstage for full-scale production. Should this happen, the playwright is treated as a full professional, from signing an option agreement to being paid royalties for his/her play. The Why, a play by 19-year-old Victor Kaufold, received a Los Angeles Stage Alliance Ovation Award nomination for ‘Best Writing – World Premiere’ as a result of The Blank’s production. Kaufold is the youngest nominee in his category in 22 years of Ovation Award history. 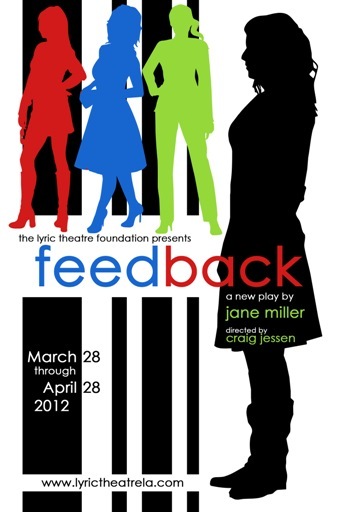 The Lyric Theatre on N. La Brea Avenue in Los Angeles, JC Gafford, Artistic Director, continues its 2012 season with the world premiere of Feedback, written by Jane Miller, and directed by Craig Jessen. There will be two preview performances on Wednesday, March 28 and Thursday, March 29, and opening night is set for Friday, March 30 at 8:00. The limited engagement will continue through April 28. Feedback tells the tale of Holly, who, to cope with the loss of her mother, spends her inheritance on a PR firm that specializes in rebranding people. Holly’s entire life is put under a microscope by a hard-nosed professional and a freewheeling eccentric who dissect every facet of her appearance, behavior, and relationships, to create a new and improved version of herself. But, as the firm’s techniques grow increasingly bizarre, will there be any room for the old Holly inside the new? Jane Miller is a playwright and screenwriter whose work has been produced by Aporia Theatre, Looking Glass Theatre, The Wellesley Project, Squeaky Bicycle Productions, and The Network. She is a contributing artist in the developmental group The Pack, part of Packawallop Productions. Director Craig Jessen is the Interim Artistic Director at The Attic Theatre, where he recently directed Romeo and Juliet, Alice Through the Looking Glass, and Much Ado About Nothing. The cast of Feedback will feature (in alphabetical order) Dorrie Braun, Karen Deputy, April Grace Lowe, Cody Roberts, and Angela Ryskiewicz. The set design is by Nicole Dietel, the lighting design is by Ryan Schull, and costume design is by Angi Ursetta. The stage manager is Stephaine Boltjes. Dorrie Braun produces for the Lyric Theatre. Feedback will play two preview performances on Wednesday, March 28 and Thursday, March 29, at 8pm. Opening night is set for Friday, March 30 at 8:00, and the engagement will continue through April 28 only. The running schedule is Friday and Saturday evenings at 8:00, with added matinee performances on Sundays, April 15 & 22, at 2pm. Feedback tickets are on sale now ($20 for general admission), and may be purchased by visiting www.plays411.com/feedback, www.Goldstar.com, www.LAStageAlliance.com, or by calling (323) 960-1055. The Lyric Theatre is located at 520 N. La Brea Avenue in Los Angeles, 90036. Street parking is available. For more information on Feedback, the Lyric Theatre, and the 2012 season, visit www.LyricTheatreLA.com.